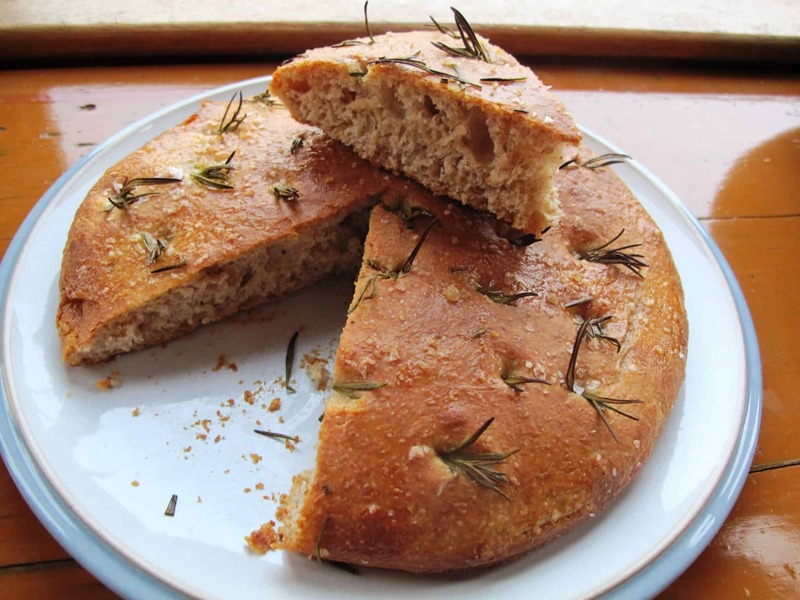 Bread recipes with rye flour. 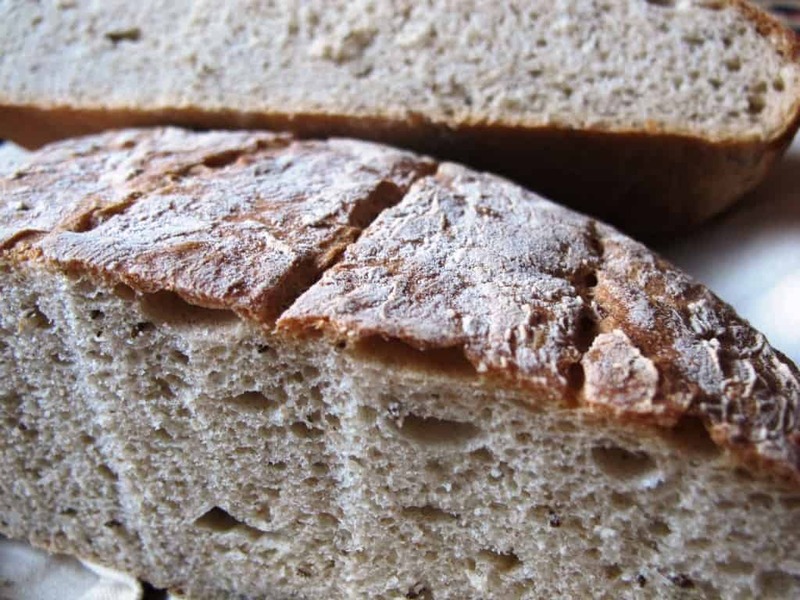 Rye flour contains less gluten than wheat flour and produces dense, dark, deliciously flavoured breads. A month ago, I visited the Zillertal in Austria for a few days of skiing on the Hintertuxer Gletscher. The weather wasn’t as good as we’d hoped for, so we visited the village of Mayrhofen, and more specifically the Erlebnis-Sennerei Zillertal on the way there. It’s a great place to pick up some local cheeses and other dairy produce. I also picked up a new type of bread – “Schüttelbrot” – which isn’t very common in my neck of the woods in the North of Austria but what a revelation! 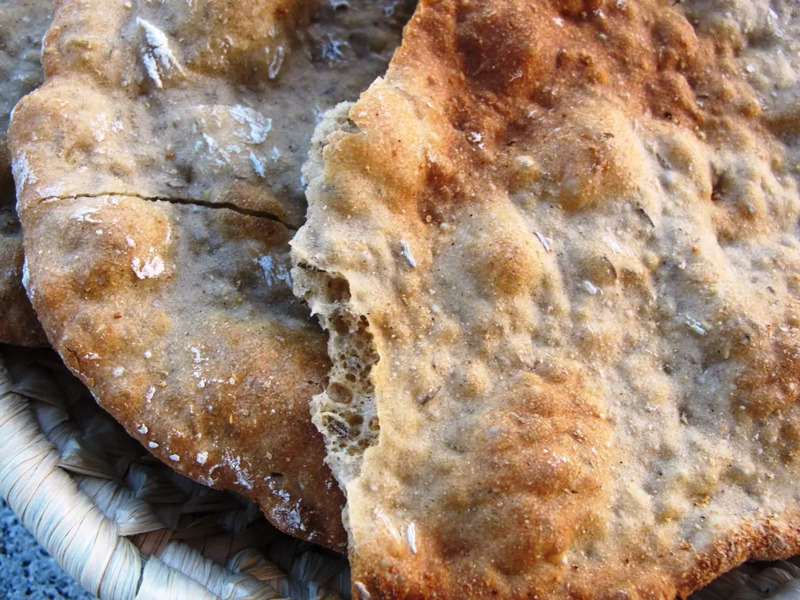 The ingredients on the label are listed as 83% rye flour, wheat flour, yeast, fennel, caraway seeds, salt and blue fenugreek (a spice which I also used over here to bake Vinschgerl – Rustic South Tyrolean Rye Flatbreads. 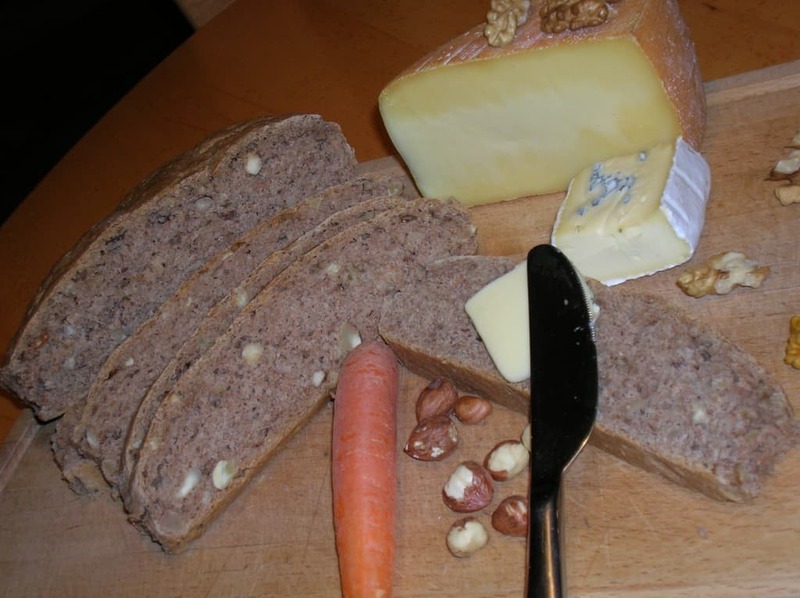 Schüttelbrot is the smaller, harder and more durable relation of Vinschgerl. 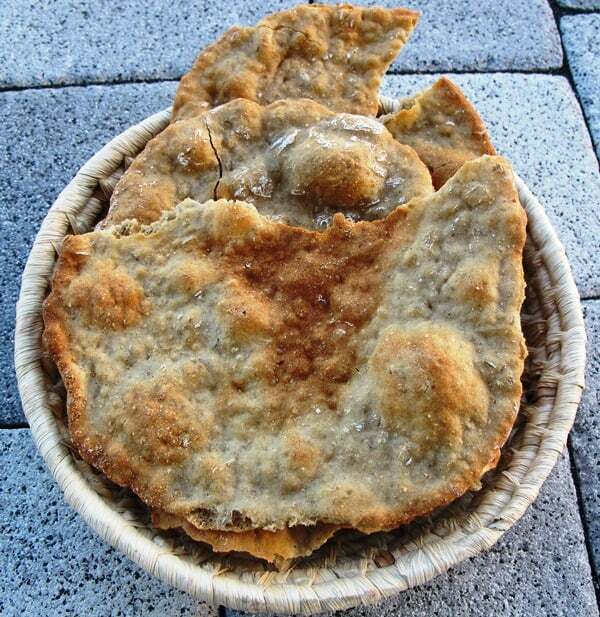 Traditionally, Schüttelbrot has been popular on Alpine Tyrolean farms where using fresh produce wasn’t really a viable option. 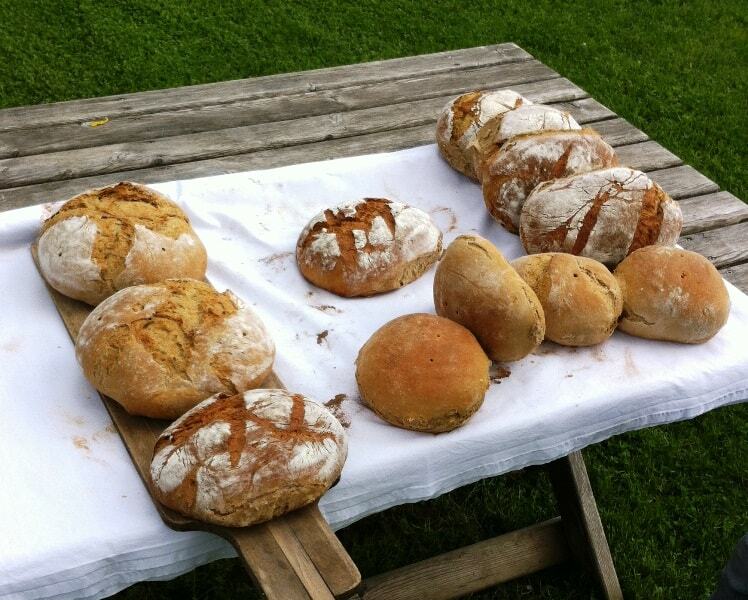 The name ‘shake bread’ makes reference to shaking during the baking process which loosens and flattens the bread. The flat shape ensures the bread hardens quickly which in turn makes it very durable. 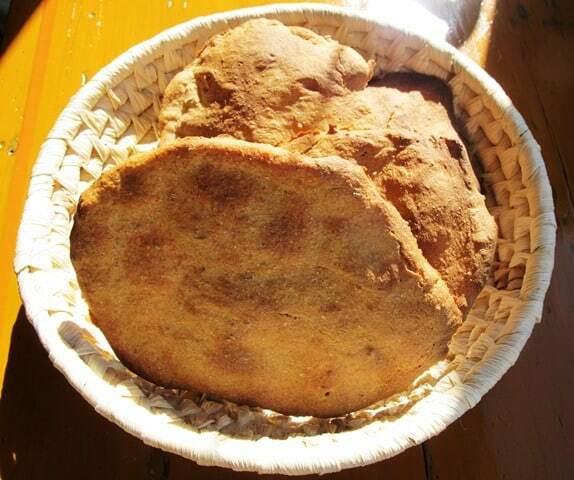 The flatbreads need to be stored in an airy, dry space. They taste great with cold cuts of meat and cheese. 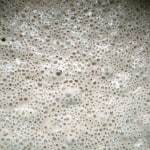 Combine the sourdough starter, rye flour and water in a bowl, cover and rest for 16-24 hours. Combine all ingredients including the sourdough starter from the day before. Cover and rest for 1/2 hour. Using a dough scraper and take out dough at approximately 150g for each Schüttelbrot piece. The dough is quite sticky and therefore it can’t be rolled out. 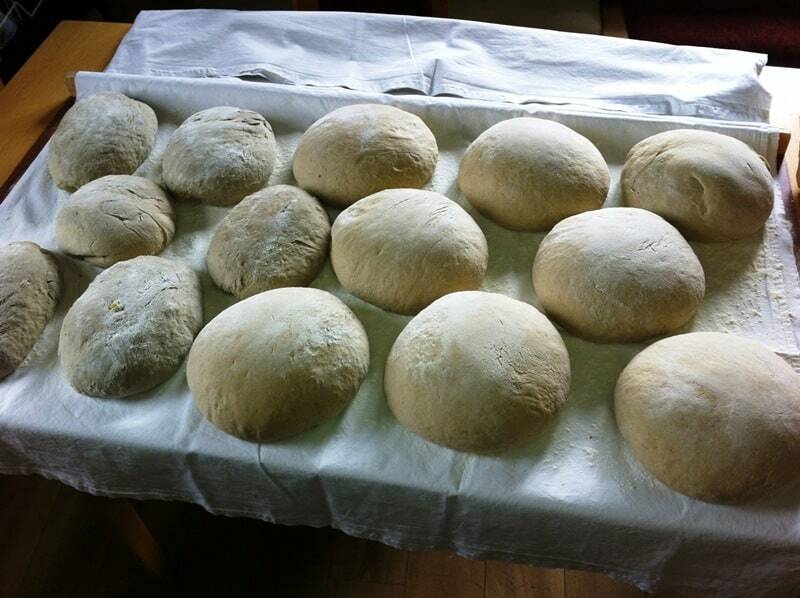 The dough parts are therefore placed in a baking tray then shaken until each piece has been shaped into a round, flat form a couple of millimeters thick. This recipe produces dough which is even stickier than shown in the videos. By way of cheating, I have been using a silicone spatula to flatten the dough pieces into the appropriate shape! This works really quite well, so for those of us who aren’t quite mastering the art of ‘Schütteln’, this is a good workaround. Bake the shaken dough pieces at 210 °C for approx. 25 mins. Cool and dry on wire racks. 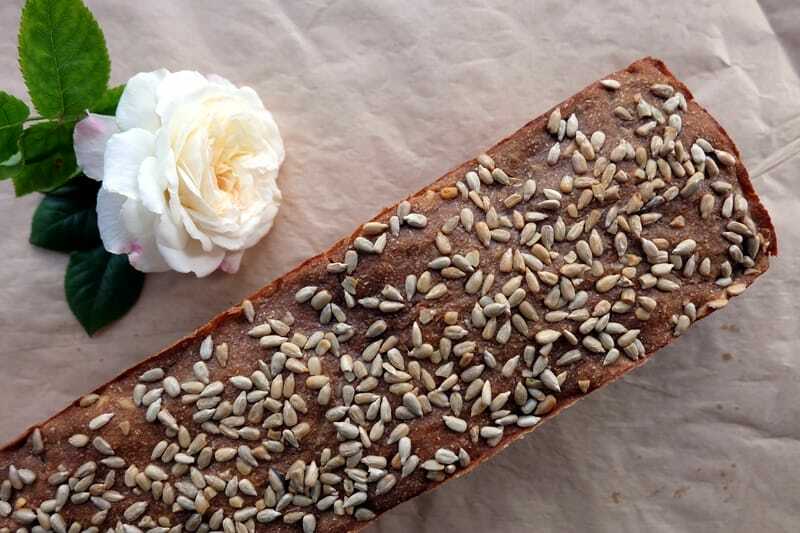 This German sunflower seed bread recipe makes a delicious loaf of rye-based bread which is infused with the earthy flavour of dry-roasted sunflower seeds. The recipe is inspired by Gerhard Kellner’s “Rustikale Brote aus deutschen Landen“. 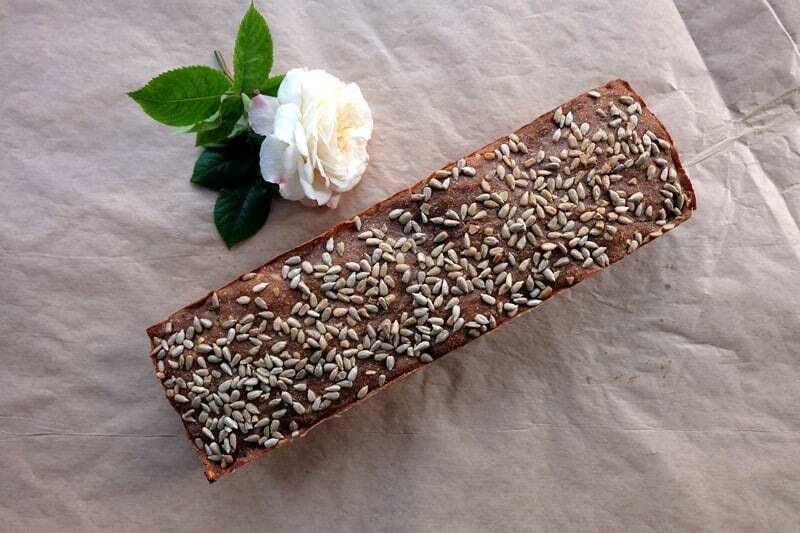 A great way to use sunflower seeds in bread baking! Combine all ingredients in a bowl, mix thoroughly, cover and keep at room temperature for 16 to 18 hours. Dry-roast the sunflower seeds in a frying pan, then finely chop the seeds in a food processor. In a bowl, combine the chopped seeds with the water and cover for 16 to 18 hours. Combine all ingredients (except the oil) and knead for a few minutes. Place the dough into a bowl and cover. Keep at room temperature for about an hour. Grease a 30 cm loaf tin. Put the dough in the baking tin; use wet hands to distribute the dough evenly. Depending on the temperature in the room, the proofing process will take between four and ten hours (the warmer the room, the quicker the proofing). Bake for 15 mins at 250°C, then reduce the heat to 180°C and bake for a further 40 minutes. Delicious with smoked salmon and salads, enjoy! A shout-out at this point also to Roland and Romana, loyal readers of TheBreadSheBakes – thanks for your support! A new favourite! 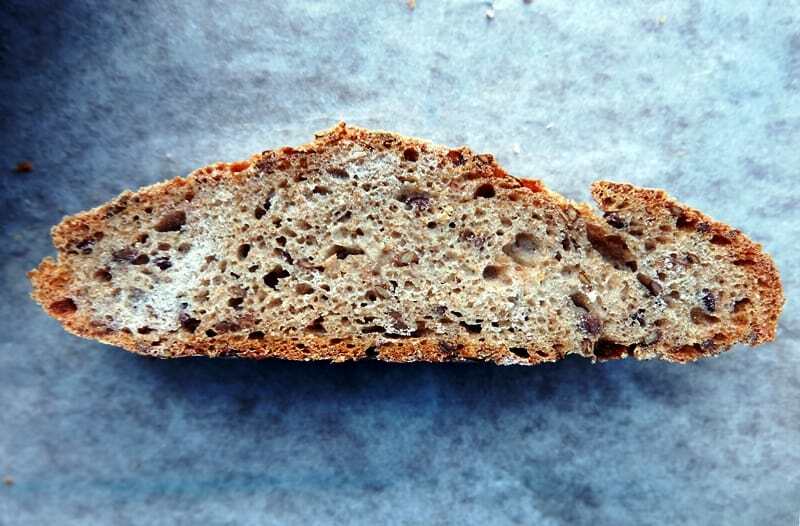 This rye bread with sunflower seeds is amazing – rye sourdough, malt and toasted sunflower seeds give this bread its delicious flavour. While sunflower seeds usually only have a very mild taste, toasting them evokes a wonderfully nutty flavour. Additionally, they are a great source of Vitamin E, copper, vitamin B1, magnesium and selenium. The recipe is from the book “Rustikale Brote aus deutschen Landen” by Gerhard Kellner. 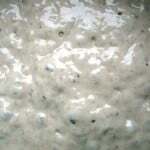 In a bowl, combine 160g dark rye flour, 160g water and 16g rye soudough starter. In a pan, dry-roast 100g sunflower seeds to unlock the nutty flavour, mix with 8g salt and pour over 100g boiling water. In a bowl, combine 232g of dark rye flour, 7g of salt, then pour over 232g of hot water, combine and cover the bowl. 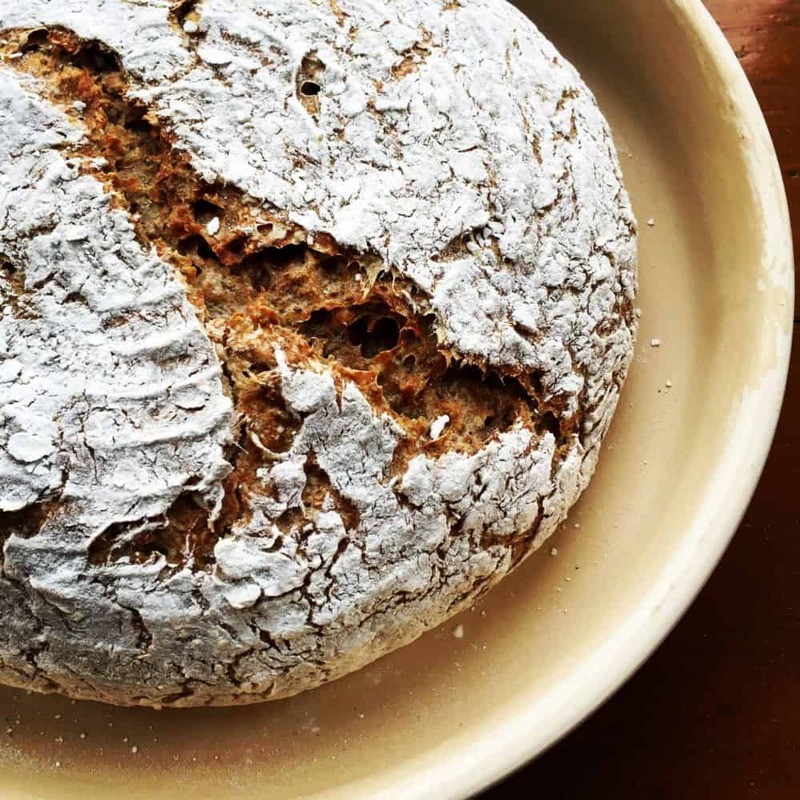 Combine the sourdough, sunflower seeds and scalded rye flour from the day before with 166g wholewheat flour, 3g dried yeast and 1 tsp liquid malt extract. Cover the dough with the bowl or, if the the dough is still in the bowl, cover it with cling film, and rest for 30 mins at room temperature. Prepare a bread baking tin (ideally approx. 23 cm x 11 cm x 9.5 cm, but a slightly larger tin like this will work as well) by brushing it with melted butter and scatter sunflower seeds into the tin (bottom and sides). Knead the dough once more before placing it into the tin, levelling it out and sprinkling more sunflower seeds on top. Cover with cling film or a damp kitchen towel. Proof at room temperature for approx. 3 hours, until the dough has visibly risen and almost reached the edge of the tin. 1/2 hour before baking, preheat the oven to 250°C. Place the tin on the 2nd rail from the bottom and bake for 15 mins at 250°C. Then reduce the temperature to 180°C and bake for a further 45 mins. 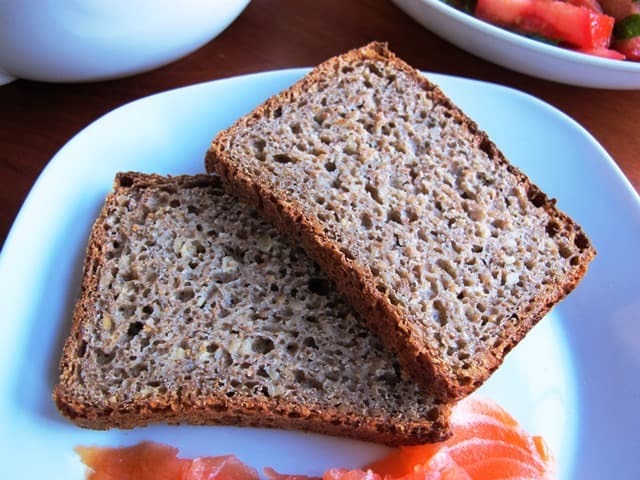 Packed with great tasting flax seeds, this flaxseed bread recipe is one of my current favourites. 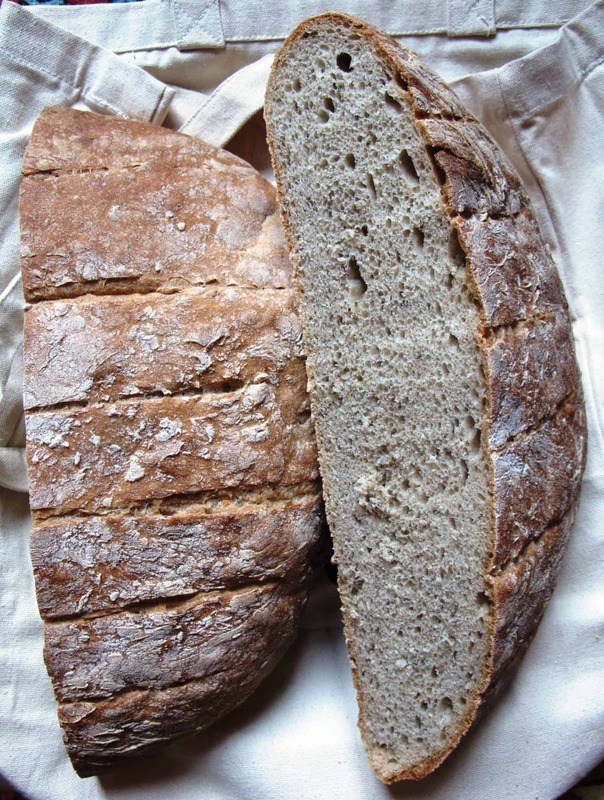 I love baking with rye and use both wholemeal rye flour as well as whole wheat and white wheat flour in the recipe. 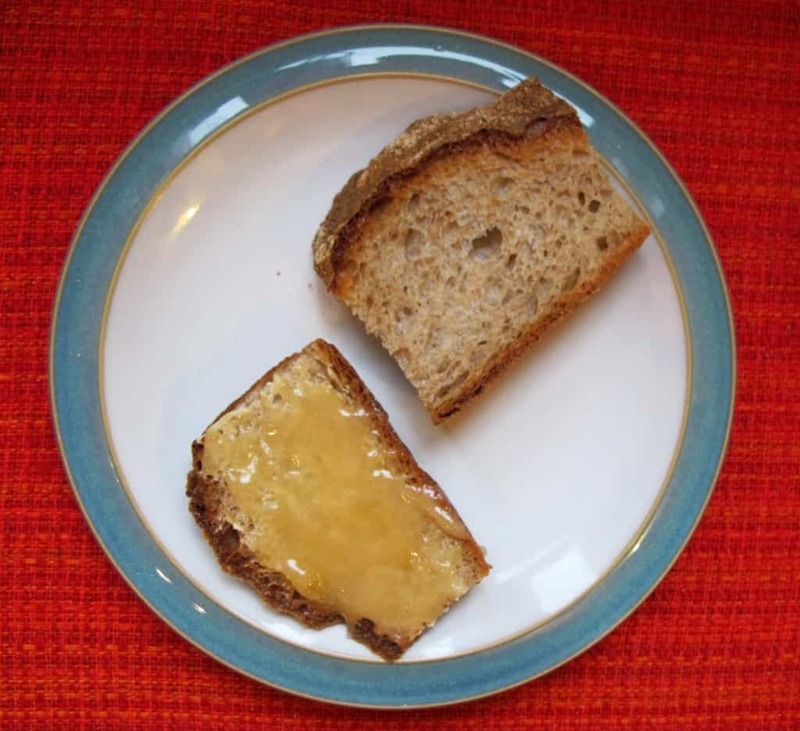 The result – a robust loaf of wholesome brown bread filled with crunchy seeds. Delicious with butter and jam for breakfasts or as a side to creamy vegetable soups. Thanks to the way the seeds are soaked, the bread will stay extra-moist for days after baking. It also tastes delicious when toasted as the heat will bring out the nutty flavour of the seeds. Give it a go – you’ll love it! There are two basic varieties of flax seeds: brown and yellow/golden. 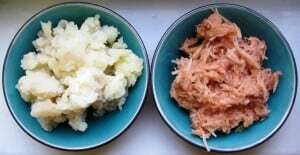 Nutritionally, they are very similar; both types are a great source of dietary fibre, antioxidants and a type of omega-3 fat. It’s important to soak the seeds before baking (see another example of this technique in my Kamut flour bread recipe). 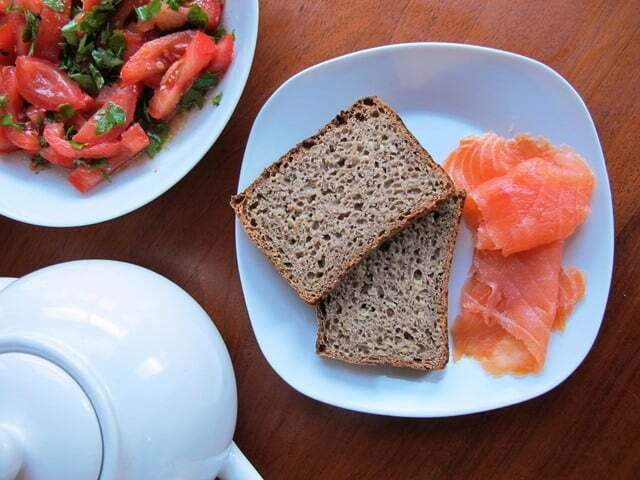 If flax seeds are not soaked, they absorb moisture from the bread and dry out the crumb quickly. 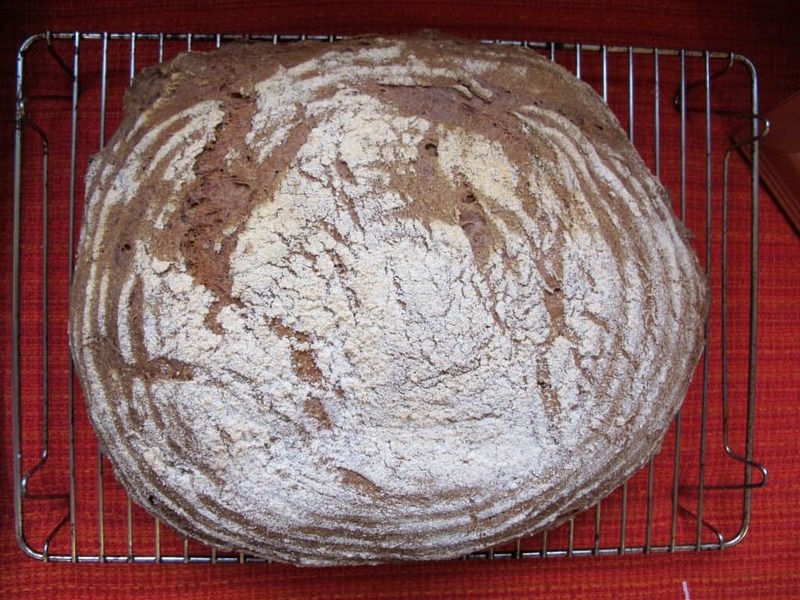 My recipe was inspired by the Flaxseed Bread in Jeffrey Hamelman’s book ‘Bread: A Baker’s Book of Techniques and Recipes‘ and uses both sourdough as well as a small amount of dried yeast. Prepare the sourdough by combining 30g sourdough starter, 50g dark rye flour, 50g wholewheat flour and 100g water in a medium bowl. Mix well then cover with a lid. Leave to rest at room temperature for 16 – 24 hours. 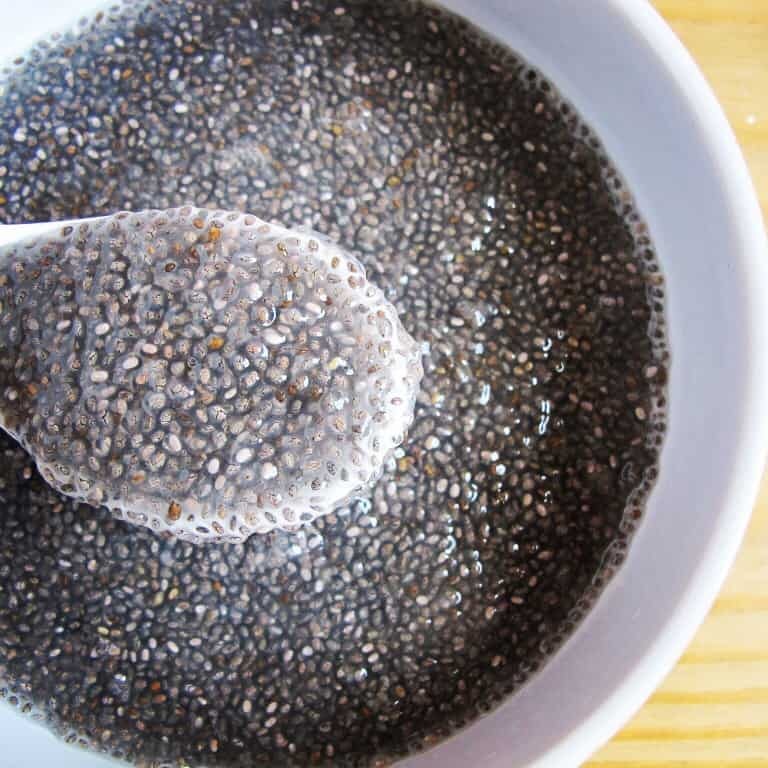 For the flaxseed soaker, combine 90g flax seeds with 200g cold water in a small bowl. Cover and set aside until needed. 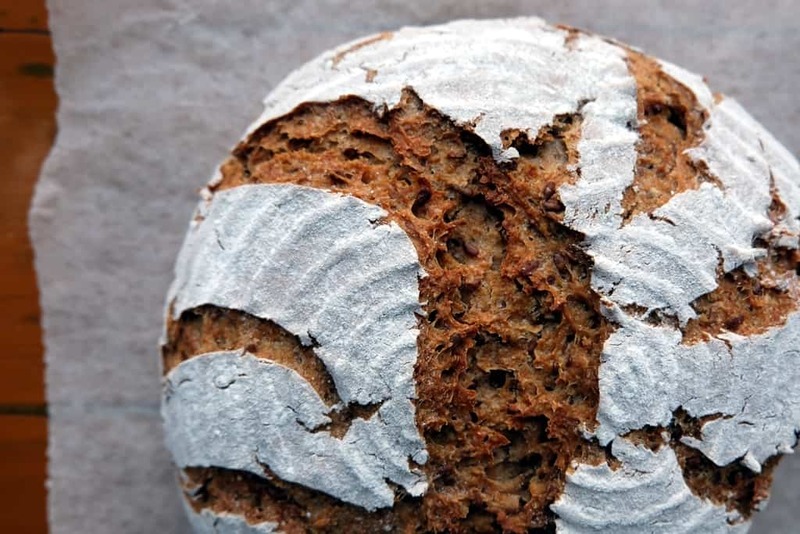 Combine all ingredients: 200g of the sourdough (rest goes back into the fridge for your next bake), 125g dark rye flour, 50g whole wheat flour, 175g strong white flour, 130g water, the flaxseed soaker, salt and dried yeast in a large bowl. Knead for 10 minutes. Have some extra water ready as you might need to wet your hands and the worktop a few times depending on the dough’s consistency. You should end up with a soft, slightly sticky dough. Shape the dough into a ball, place it into a bowl and keep it covered for 1 or 2 hours – it should have quite visibly risen by then. Give the dough a quick 10 second knead, lightly flour the dough surface all over and place it into a lightly floured proving basket. Cover with a polythene bag and keep in a warm place for another hour or more until it has expanded significantly and is fully proved. Preheat the oven to 240°C – if using a La Cloche baking dome, preheat at the same time from cold. 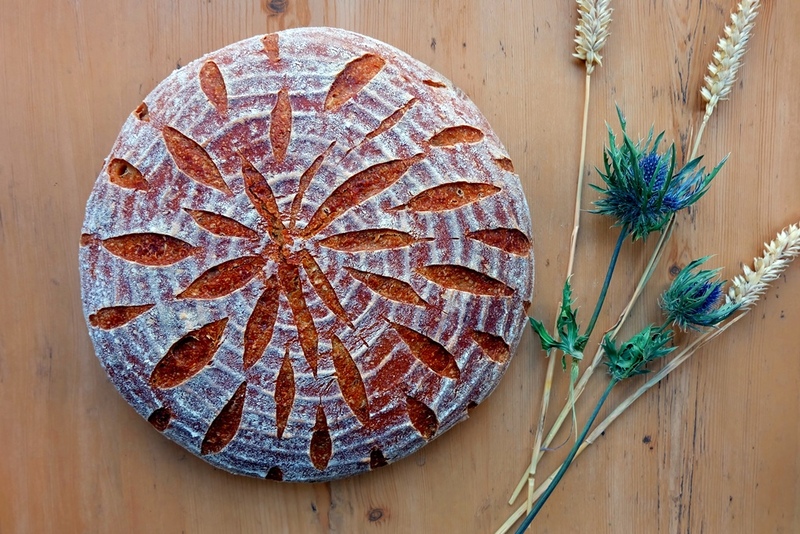 Turn the loaf out onto a baking tray lined with baking paper or the La Cloche baking dome bottom. Bake for an initial 15 minutes, then lower the temperature to 220°C and bake for another 30 to 35 minutes. A fantastic recipe brought to you by Annemarie and her son Martin Buchmayr from Franking in the Austrian Innviertel! Built by Martin with bricks (bottom part), concrete (middle layer), firebricks (for the dome), plaster and a tongue and groove baking surface made of polished firebrick. The dome has been externally insulated to ensure it keeps a constant temperature. Beechwood is used to fire the oven. 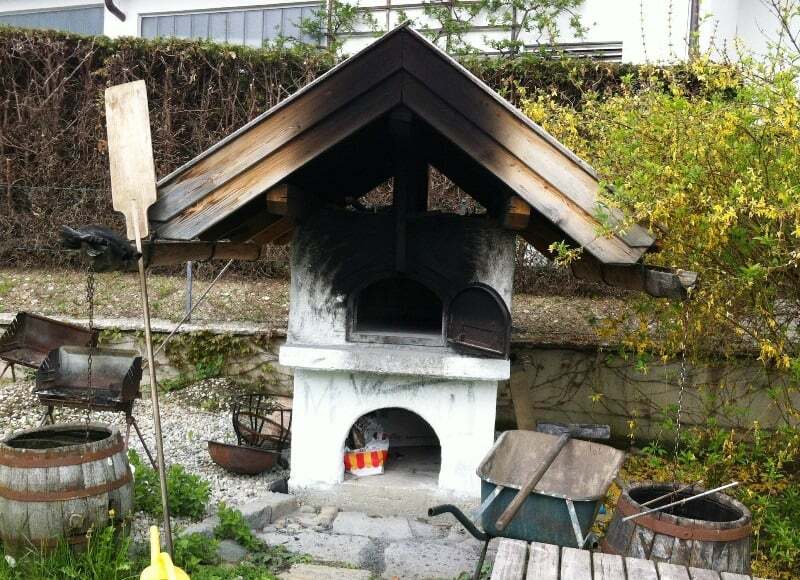 On a normal baking day, the oven is fired up around 11am and the fire is kept going until about 2pm. The ember is then spread evenly and any openings are closed. 45 minutes later the process of clearing out and wiping out starts until the required temperature is reached. 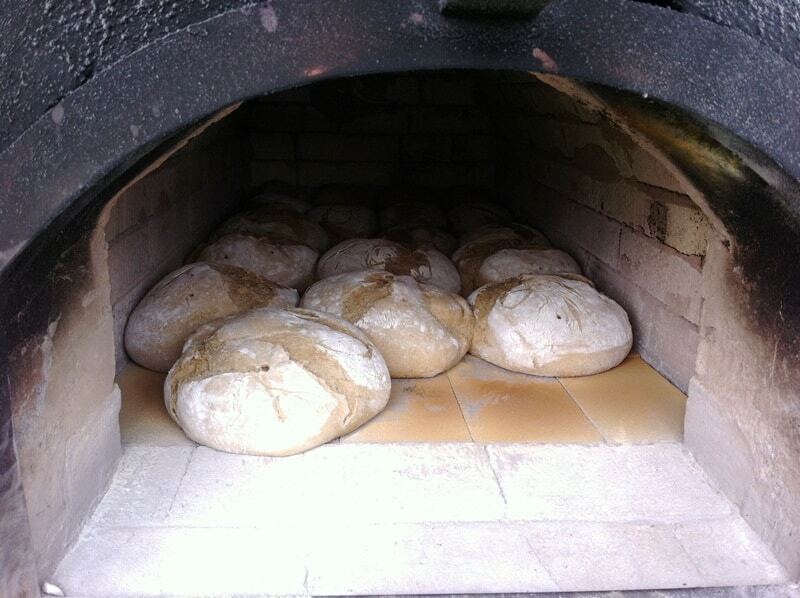 Annemarie and Martin bake every second Saturday and usually produce around 15 to 20 1-kg-loaves. Combine 100g rye flour with 150g water, add 20g fresh yeast (or 6g dry yeast) and 1 tsp of sugar to form a pulpy mixture. Feed the mixture with a little flour and water (approx. 50g each) on days 2 and 3. 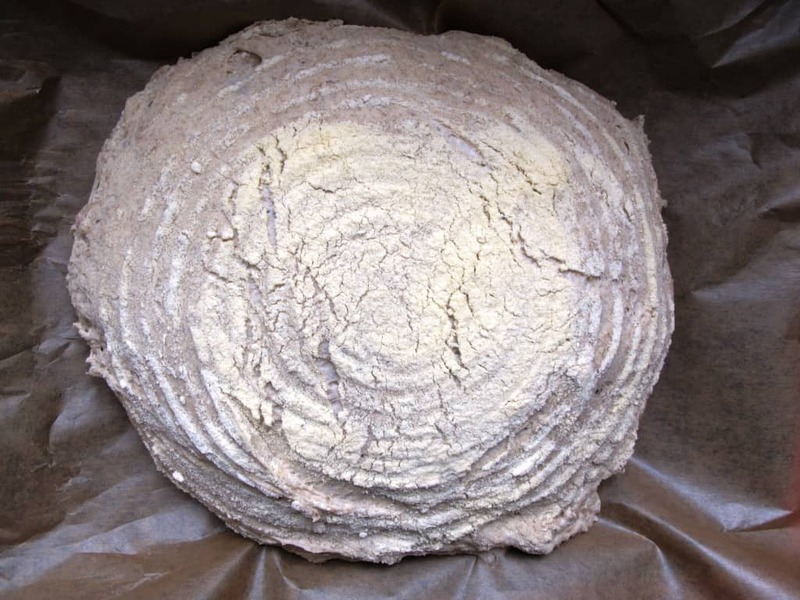 Don’t feed the preferment on the day before baking, just stir it and leave it to rest. Store any leftover preferment in the fridge (or freeze it), it can be used again for the next bake. This is a recipe my aunt from Höhnhart, Upper Austria shared with me (thank you Berta :-)). 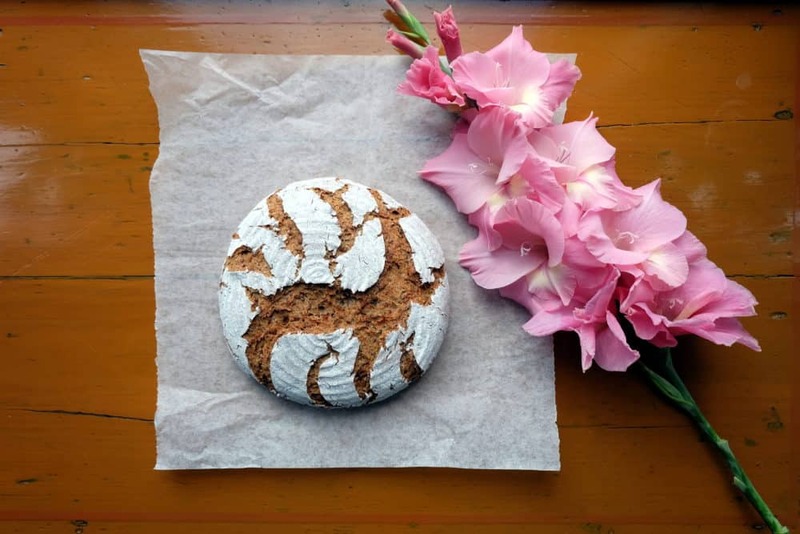 Berta and I are connected by our passion for bread and while she has been a master for years, I’m just at the beginning of my bread journey! 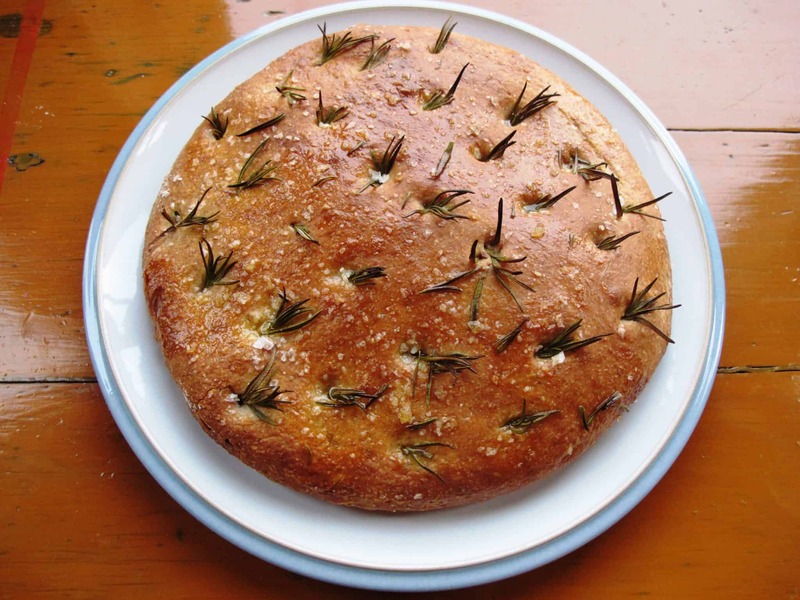 This bread is super-delicious with just butter and cheese. 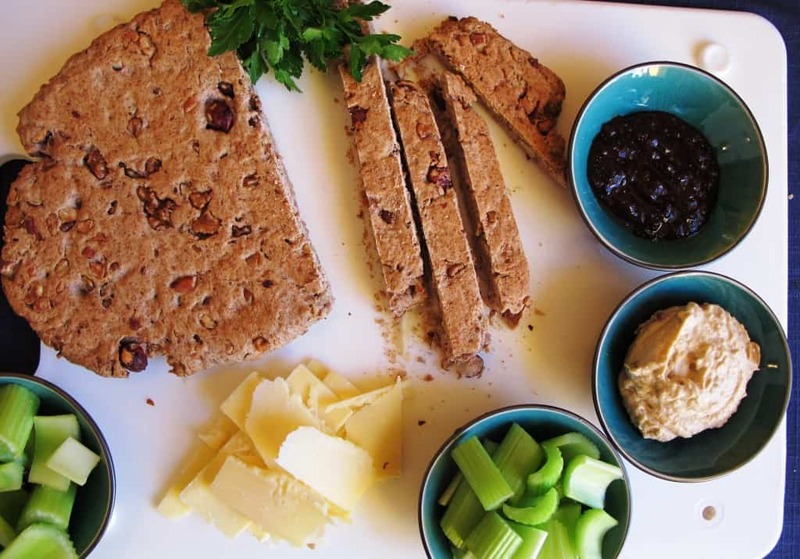 Add carrots, celery and some chutney and you have a perfect afternoon snack! In a separate bowl, mix the flours and salt with a balloon whisk. Add the dissolved yeast and water, olive oil and the mixed nuts to the flour bowl. Use the dough hooks of your hand mixer and knead the dough until smooth. Alternatively, hand-knead for 5 minutes or so. I added a little bit more water to get the right hydration as the rye flour I used was very coarse. Cover the bowl with a clean kitchen towel and leave to rest in a warm place for 45 minutes until the dough has doubled in size. Turn the dough out onto a clean work surface and knead for a minute. Roll out each part to reach 25cm in length. You can work with a rolling pin or just work the dough into a round or oval shape with your hands. Place the loaves onto the baking tray. Thanks for the tasty recipe Berta!